“Zurigo” model display case is studied for the display of products on baking-pan or tray, suitable for gastronomy, pizza shop and hot table. The glass frame structure is fixed on the work surface in rosa porrino granit, as standard (or onother material on demand) and it’s composed by rounded profiles in silver anodised aluminium, as standard (or gold anodisation on request), with a top shelf with neon light and possible intermediate shelves with correspondent neon light. Frontal glasses can be fixed, as standard (or with bascula opening system on demand). Glass end sides are lined up to the work surface. 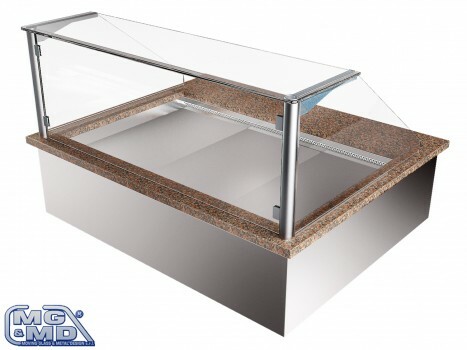 This model is available with different versions (with ventilated refrigeration, dry heated, bain-marie heated and neutre) all counters can be couppled between them with the possibility to realize ambient corners made to measure.